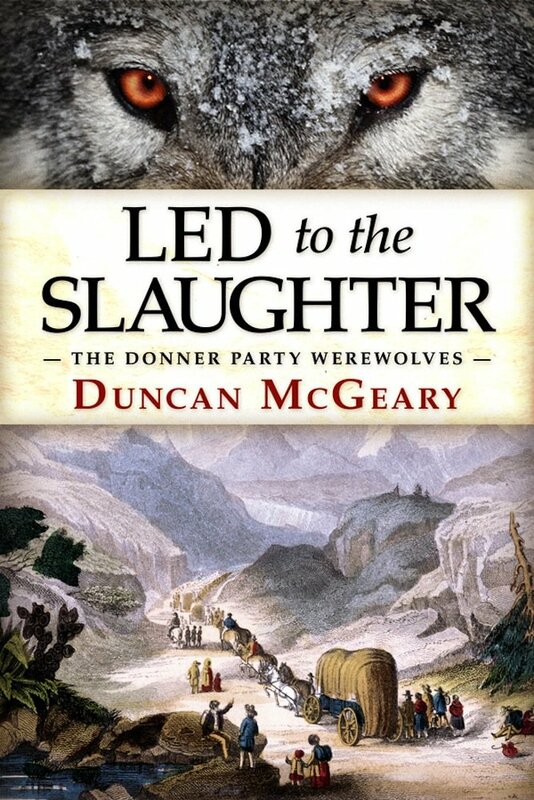 Led to the Slaughter is a werewolf tale by Duncan McGeary, published by Books of the Dead Press in early 2014. This was the first novel I’d read by Duncan and I wasn’t sure what to expect, but I thorougly enjoyed it. The story is a spin on the historical events surrounding the Donner Party and the claims of cannibalism which surrounded their ill-fated expedition to California in the mid-19th century. The Reed family seeks to travel west across the country on the Oregon Trail so that the father, John Reed, can start a new job in California and the family can make a new life. They join a caravan party lead by Jacob and George Donner, who are, unbeknownst to all, werewolves on the way to a clan meeting to decide the the dwindling clans among the realms of men. The tale is one of a harrowing and oppressive journey for caravans through inhospitable lands. Before they reach their final destination, many die of exposure, famine or violence. You really get a sense of what it may have been like to be one of those colonial settlers forging a path out West. I suspect a lot of time and effort went into researching this novel and it’s really paid off. Hat’s off to Duncan. The story is, mostly, told from the perspective of Virginia Reed, by way of her diary. Diary entries of others, including John Reed and Charles Stanton, flesh out the story and give a great picture of the over all group and the adversities they’re going through and how they’re coping with the arduous journey and their various confrontations with the Donner Party werewolves. Virginia Reed is a fantastic character. A young teenage girl with real hopes and fears, she stoically faces a host of challenges at every step. The girl is stubborn as a mule and a real fighter, yet finds love and romance along the way and manages to put some of the men back in their places. She’s a fantastic character with a strong and endearing voice. You can’t help but like her and she’s a pretty badass girl. If you like strong female characters, Virginia Reed is your girl. While there are certainly plenty of action scenes and violence in the book, its not over the top or too graphic, and combined with the strong focus on Virginia Reed as one of the main protagonists, I get the feeling that this actually a Young Adult horror novel. Or at least, many teens would probably really enjoy this novel, as much as us adults! My only regret is that I didn’t have the time to read this story in one hit and had to spread it over a few weeks, due to new family additions and my editing commitments. Duncan Mcgeary is a solid author, who shows a real knack for weaving not only weaving a dark tale but weaving for us real people and real events. I can’t wait to sink my teeth into his Vampire Evolution trilogy, also recently released by Books of the Dead. Bram Stoker Award nominated writer and editor Marty Young is editing a new anthology for Cohesion Press, titled Blurring the Line. 8c/word pro-rate, with a respected editor and from a exciting new press who’ve worked with some real talent. I’ll be kicking myself if I don’t at least sub to this one.